This IBM IBM Redbooks publication introduces a top-down architectural mindset that extends considerations of IBM z/OS Parallel Sysplex to the application level, and provides a broad understanding of the application development and migration considerations for IMS, DB2, Transactional VSAM, CICS, and MQ applications. Parallel computing and data sharing technologies are playing a major role in e-business computing. Despite their compelling capabilities, however, these technologies are virtually unknown within the application architect and developer communities and are deployed more like operational enhancement technologies, with limited application involvement. Parallel Sysplex deployment models often expressly attempt to segregate the application environment from the underlying environment. But today’s software engineering principles recommend that you view applications to be designed as the drivers for availability and data sharing requirements for any technology. 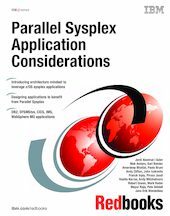 This publication explains how to achieve this objective by designing applications to exploit the capabilities of Parallel Sysplex.